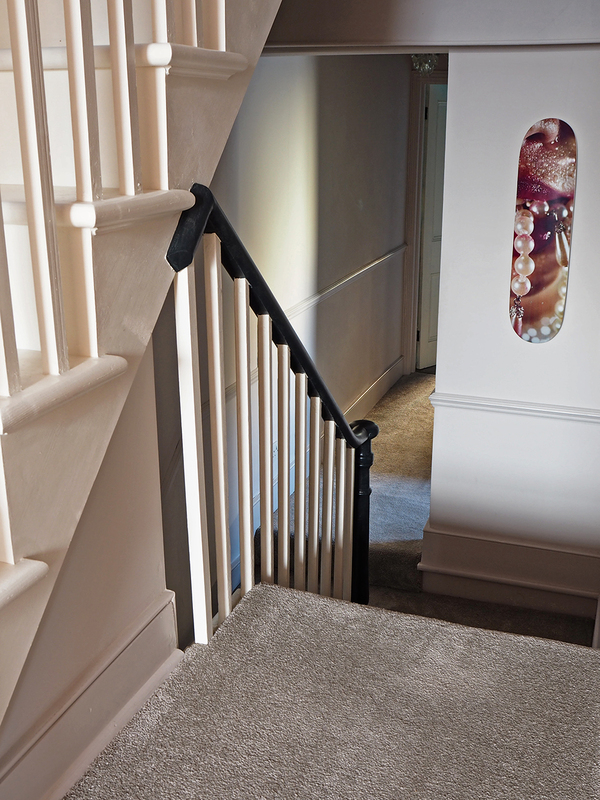 I haven’t shown the hallway and stairs on the blog for a LONG time. Purely because aside from a lick of paint, nothing had changed except that the old carpet had gotten increasingly grotty. 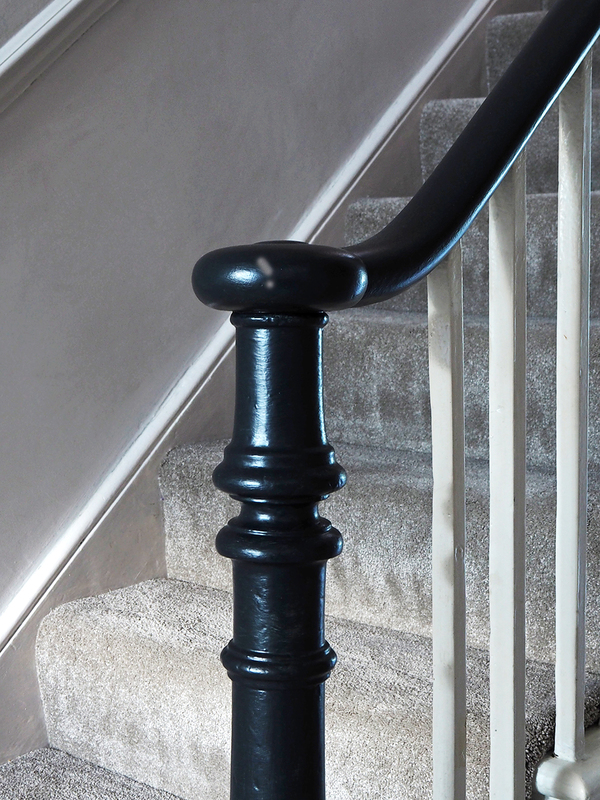 Come to think of it, the upper stairs and landings have never been on the blog or instagram, so here's a little peek at some parts of the house you won't have seen before. Like ever. Unless you've been to my house. Duh. The carpet really needed to be replaced after we did the loft over six years ago, but other things always took priority and it got ignored. It drove me completely batty to be honest; the lavender carpet that I once loved, was faded, flat, fraying and frankly, filthy. Yes, ALL the F's. I didn't want to spend the money having it professionally cleaned when it was so far beyond saving, so I did the best I could using supermarket products, which to be honest, don't make much difference at all, and tried to ignore it. You might remember a while back on my stories that I ripped up Baxter’s carpet when I could stand it no longer, and gave the very knackered old boards a quick sand and paint, which although a vast improvement, it made an already cold room even colder, which wasn't ideal at all with winter approaching. 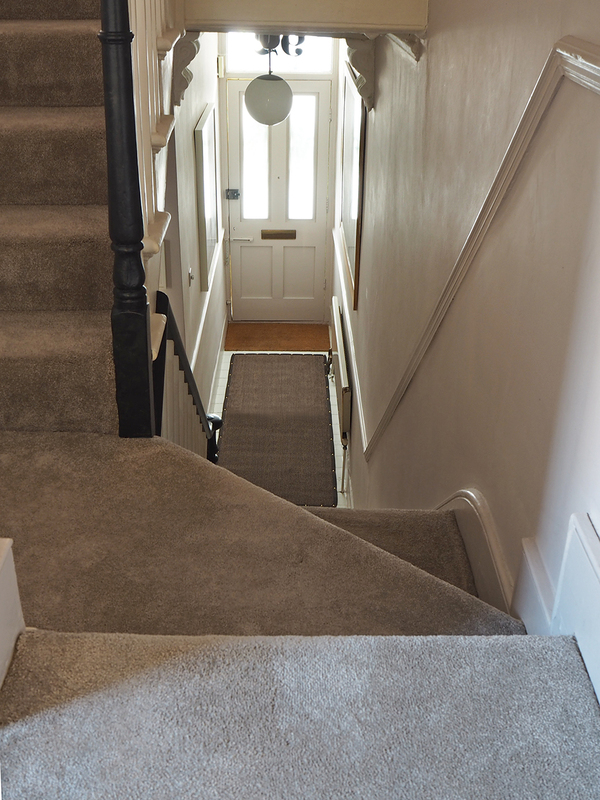 I couldn’t wait to put new carpet not only on the stairs, back hall and landings, but to take it into all three bedrooms too. Edie's bedroom and my bedroom had white painted floorboards, and Edie's in particular were in pretty bad shape. It also gives a real sense of luxury and comfort. The kids were literally jumping for joy when we came back to freshly laid carpet after our pretty rubbish journey home from our summer holiday - both of them rolling around with delight on it. The joy they were expressing physically, was pretty much how it made me feel emotionally! It’s that comfort and warmth that just can’t be matched with hard flooring, and I feel it’s so much better suited to bedrooms. 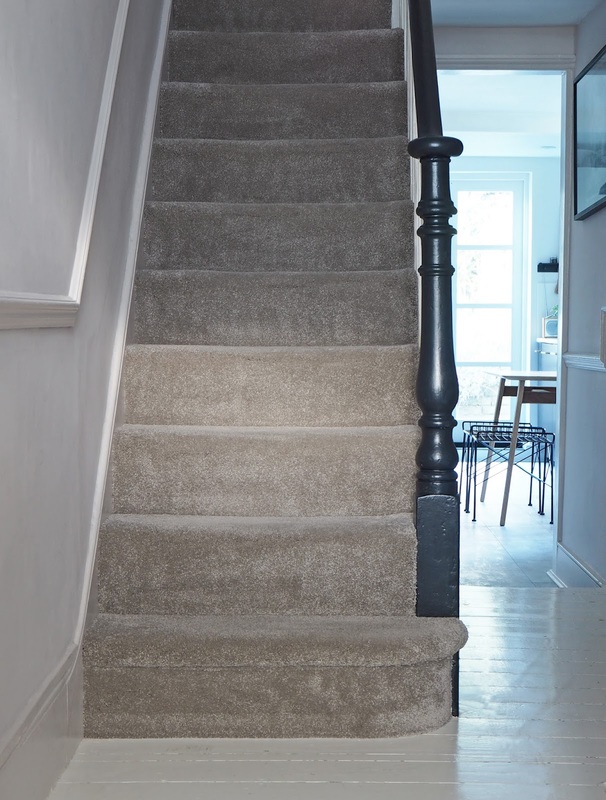 The Cormar carpet I chose is from the Sensation range and the colour is Light Taupe, a warm grey, and more of a mid-tone than light. It's a lovely neutral colour that works with all the other colours in the house, and will continue to do so as I change wall colours (if you're new here, the walls in this house tend not to stay the same colour for very long!). What I love about this carpet is not only it’s softness underfoot (it’s SO soft and plush! ), but also the gentle velvety sheen it has when the light hits it. 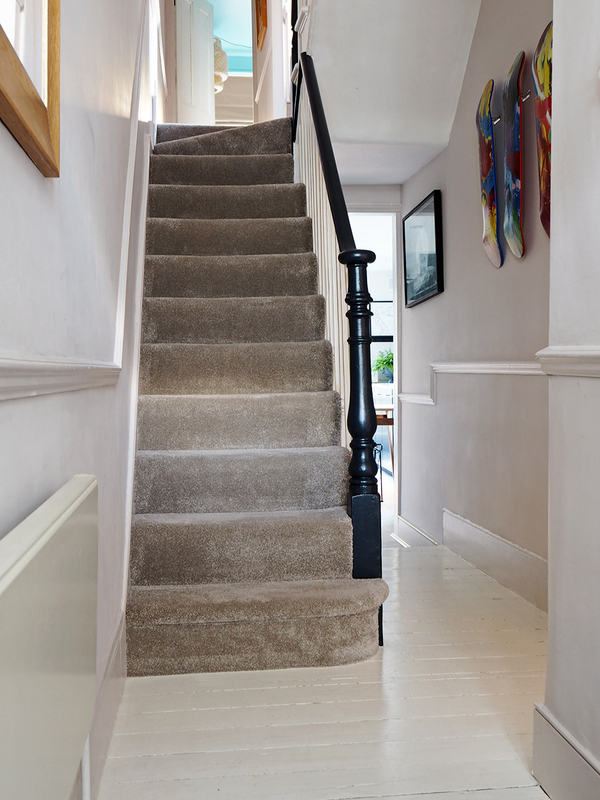 Perhaps controversially, I personally prefer non-wool carpet because aside from the fact that you have no shedding or smell to deal with, it’s as tough as anything, stain resistant, and perfect for a busy family home like ours. The stairs are one of the first things you see when you come into the house, and the old carpet was such a depressing sight. 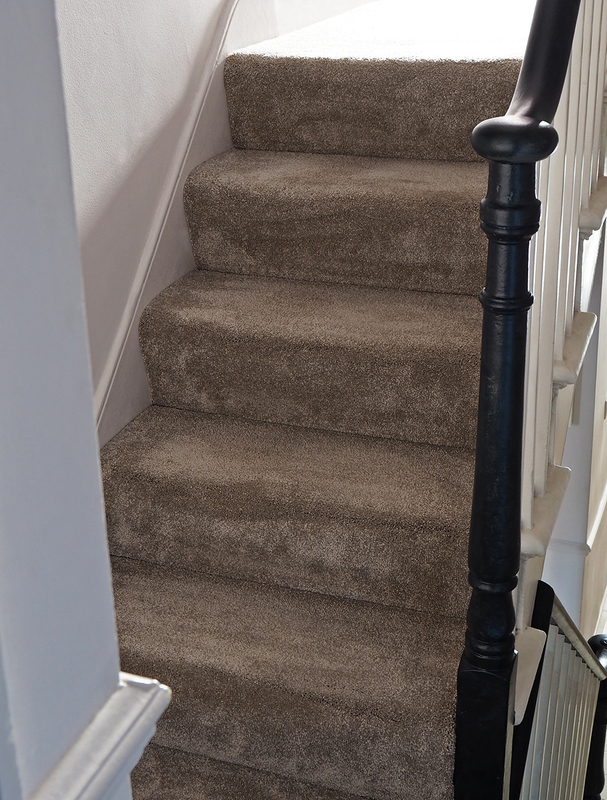 The new carpet has totally transformed the entire look and feel of the house. Not much else has changed in the hall, I painted it mid to late last year, and this week I also painted the banister black, which I’ve been thinking about doing for ages. It feels much more fresh and modern than the previous white, and leads the eye through into the back accents in the kitchen. I’ve left the spindles and visible stair edges white for now, and that works with the white painted floorboards, but I expect I'll end up painting those black too if I manage to replace the floorboards next year. Fingers crossed! 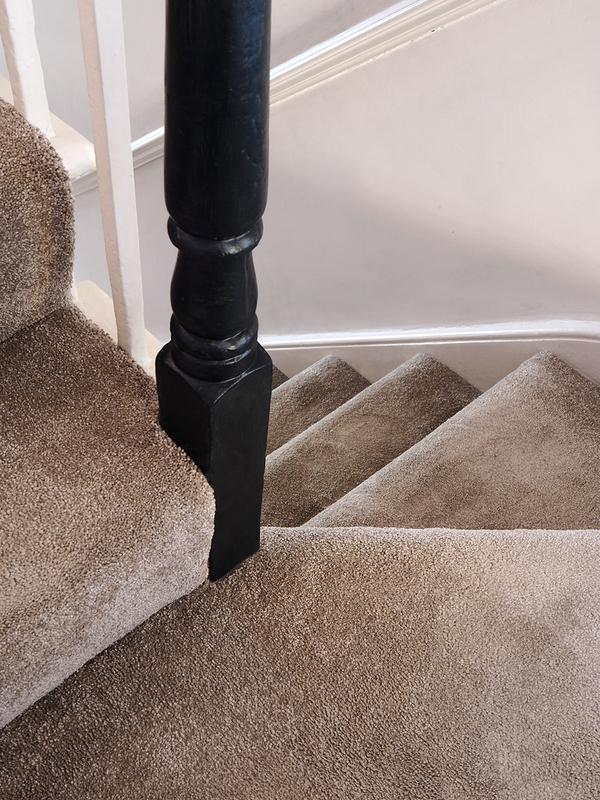 If you’re considering carpet in the new year, I wholly recommend you check out Cormar Carpets extensive collection. This post is in collaboration with Cormar Carpets.